We take a break this week from Western Civilization and instead turn to the great ancient empires in the East: India and China. This requires learning about several new belief systems, including Hinduism, Buddhism and Confucianism. Then we conclude by returning to the Middle East and discussing the rise of Christianity. Let's ask ourselves at the outset: why learn about any religion other than Christianity? Some Christians might conclude that, having found their faith, there is no reason to learn about non-Christian religions that go in a different direction. But there are several valid reasons to study other religions. Christian missionaries, for example, need to understand the religions of the peoples they are attempting to convert. World leaders and travelers should understand the different religious views of peoples they encounter, even if they are not trying to convert them. In business it is important to know the values and beliefs of people with whom you deal. Just as language shapes a culture's success and way of thinking, religion plays a large role in society. It is easy to see the differences between, for example, Islamic and Christian culture. Each has its own way of life, dress, social structure, and much more. It is also possible that learning about other religions, and how they differ from Christianity, can strengthen one's appreciation of Christianity. Christianity has spread more than any other religion, moving from the Middle East to the Roman Empire to the Northern Barbarians in Europe and eventually to all of Africa and both North and South America. Islam, in contrast, has always been strongest in the Middle East, where it began, and hasn't spread nearly as wide as Christianity or as far across different social classes. One final reason to study different religions and cultures is to see how distant peoples struggled with religious issues without the benefit of Christianity and came to certain conclusions about life, morals, and unseen truth. Little information survives concerning the history of ancient India. There was migration into the region in the second millennium B.C. (between 1000 and 2000 B.C. ), by people who called themselves "nobles" or "Aryans", a term we explained in the prior lecture. These immigrants spoke an Indo-European language that formed the basis for Sanskrit, which is the standard ancient language of India just as Latin later became the standard ancient language of Europe. Yet while Latin is a dead language today, Sanskrit is still an official language in India. The scriptures of Hinduism are written in Sanskrit. The most sacred of these scripts form the Vedas and Upanishads, which have the most authority, importance, and antiquity for the Indian people. 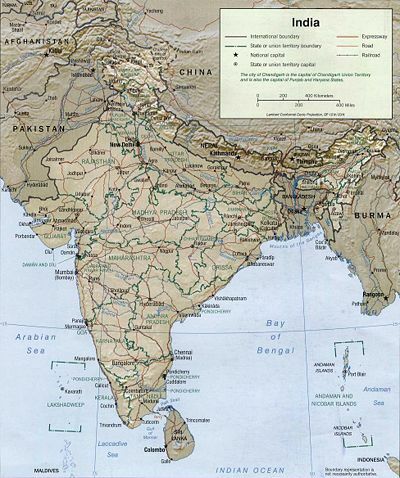 The roots of ancient India were settlements in the Indus River Valley, in what is now Pakistan and northwest India (note where Pakistan is on the map to the right). This was one of the most fertile regions in the world at the time, with plentiful farm products and animals. The region was surrounded in the north by the Himalaya mountains, protected to the west by the Indu Kush mountains, and insulated from the east by the Great Indian Desert. Just as Egypt had unique geographic protections against invasion by foreign enemies, so did the Indus River Valley. Two cities have been discovered there: Mohenjo-Daro and Harappa (pronounced "huh-ROP-uh"). Other small towns have also been unearthed. This ancient civilization existed from about 3000 B.C. to 1300 B.C., and its peak was 2600 to 1900 B.C. It is known as the Indus Valley Civilization or Harappan Civilization, named after its big city, Harappa. These early settlements existed long before classical Indian civilization, which thrived from 300 B.C. to A.D. 500 (similar in time to the Roman Empire). Writings have been found from ancient India, but no one has been able to decipher them yet. The symbols are extremely tiny, and all the writings we have contain only a few of these symbols. This is a good challenge for young experts in language (linguistics)! In terms of technology, the inhabitants of these ancient settlements were quite advanced. The ancient peoples of the Indus River Valley civilization had modern use of water: pipes, drains and even indoor bathrooms. They were precise with mathematics, and used this skill to measure weight and mass accurately. But unlike most other civilizations in the 2000s B.C., the ruins of Mohenjo-Daro and Harappa do not contain any large palaces or monuments to false gods. The ancient Indian people survived on agriculture and traded with Mesopotamia. Many of the inhabitants were tradesmen, as artistic artifacts from Mohenjo-Daro and Harappa illustrate. The fertile land and geographic protection of the Indus River Valley allowed and facilitated success by early civilizations there. The Sarasvati River, which is named after a Hindu goddess, was the largest in ancient India, flowing west of Delhi and providing water to a region described in the Rig Veda, a sacred Vedic Hindu text. (The river has since completely dried up, but was proven to have existed by satellite photographs of India.) Food and commerce in the Indus River Valley was based on barley (yava), copper (ayas) and cattle. By 2600 B.C., the Indus-Sarasvati civilization became the largest civilization in the ancient world, spreading from Pakistan to many areas of India today. It had trade connections with Mesopotamia, Afghanistan, Central Asia and elsewhere. Its population is estimated to have been 100,000, which is substantial even by today's standards. By 2000 B.C., the world's population was 27 million people, 22% of whom lived in India. Interestingly, India still contains a high percentage of the world's population, but not quite as high as back then: today India has 16% or so of the world's population, or about 1 billion people. Three of the world's ten most populated cities today are in India: Bombay (recently renamed as Mumbai), Calcutta and Delhi. The collapse of the Indus Valley Civilization came about from a mixture of geographic and human forces. Sometime around 2000 B.C., the course of the Indus River shifted away from various centers of civilization. This was compounded in the years up to 1500 B.C. by the hostile incursions of Indo-European (Aryan) nomads invading through the Bolan and Khyber passes in the Hindu Kush mountain range. The Aryans spoke Sanskrit, an Indo-European language. They conquered the Dravidians and forced them southward into what is now India. Hindu literature describes these struggles in the "Rig Veda" and two long poems known as the "Mahabharata" and the "Ramayana". By 900 B.C., iron smelting was discovered and became useful in making weapons and tools to clear fields and the jungle for agriculture. The Aryans were very successful in cultivating the land along the banks of the Ganges River Valley, aided by forceful winds known as monsoons that brought rain from the Indian Ocean. Rice was the most popular crop, and remains the world's leading crop even today. By 975 B.C., King Hiram of Phoenicia encouraged trade between India and King Solomon of Israel. In 950 B.C., Jewish people arrived in India in King Solomon's merchant fleet, and later established colonies there. Around the same time, perhaps due to increased trade, Sanskrit began to decline as the spoken language of India. Priestly Sanskrit was later refined between 750 and 250 B.C. Some of the people in the Indus River Valley likely migrated southeast to what is India today. The Vedic (pronounced VAYD-ik) civilization existed from about 1500 to 500 B.C., and is credited with developing the religion and culture of Hinduism (explained further below). Notice that the "classical" civilization of India came later, after this foundation had been laid. Classical India consisted of two major empires: the Mauryan Empire (322-185 B.C.) and the Gupta Empire (A.D. 320-467). Before, during and after these empires there was very little in the way of a central government, and thus India is best understood by studying its major religion, Hinduism. This is one of the oldest and longest-surviving religions in the history of the world. India is also the origin of two other major religions, Buddhism and Jainism. One of Jesus' Apostles (Thomas) went to India and established a Christian community there that thrives to this day. The beginning of “classical India” was when the Achaemenid Persians invaded the Indus Valley region in 572 B.C. ; Aryans led by Magadha joined together to try to repel the Persians, but internal religious conflict prevented unity. Later Alexander the Great invaded this region, in 327 B.C., spreading Hellenistic (Greek) influence. The time Alexander's troops spent in India must have been a strange experience for them. For example, they had never before seen elephants. Imagine their surprise when the Indians fought from atop these massive creatures during a battle on the banks of the river. In that same battle, Alexander's favorite horse, Buchephalus, was injured and died. After that, Alexander wanted to continue East, but his troops refused, and he was forced to leave India unconquered. So only India was able to stop Alexander the Great, or at least survive his conquests. Afterward, in 322 B.C., Chandragupta Mauryan defeated the Greek general Seleucus, who ruled a large part of East Asia which Alexander the Great had conquered. Chandragupta Mauryan became king of Seleucus' land, creating the largest Indian empire in India's history. He built an elaborate capital city at Pataliputra, which surpassed even the splendor of the great Persian cities and was the largest city in the world at that time, with over 150,000 inhabitants. It was home to several Buddhist monasteries. Chandragupta Mauryan built a massive army of 500,000 soldiers and his adviser, Kautilya, wrote a book on how to maintain political power entitled the "Arthashastra". He wrote that punishment was the key to government. In other words, Chandragupta was a tough dictator. But his name is revered, as many Indians to this day bear the last name of "Chandra" or "Gupta". Chandragupta's grandson, Ashoka, underwent a religious conversion from Hinduism to Buddhism while he held power (268-232 B.C.). Buddhism emphasizes non-violence and Ashoka's conversion caused him to rule as a benevolent dictator, stressing compassion and even apologizing for his role in killing 150,000 Indians! He displayed tolerance towards all religions and helped erect shrines to Hinduism and Jainism, another religion of India. Ashoka elevated the status of women, who were already highly respected under the Hindu culture. In Buddhism women could become monks. He also promoted trade with the expanding Roman empire to the West, and with the growing Han dynasty in China to the East. But after Ashoka died, the empire fell into civil war, and became vulnerable to outside invaders, such as the Bactrian Greeks in the second century B.C. and the Buddhist Kushan in 100 B.C. A council of Buddhist monks was convened under Kanishka, King of Kushan, to regulate Buddhism, and the result was a new form of Buddhism: Mahayana Buddhism. The other major Indian empire was the Gupta empire, from A.D. 320 to 467. In A.D. 320 Chandra Gupta I rose to power, who had no connection with the prior ruler Chandragupta Mauryan. Chandra Gupta I conquered the Ganges Valley, and established a new Hindu dynasty. Trade with the rest of the world flourished under his regime, and he had a policy of religious tolerance. Intellectual and economic achievement was high. One famous poet and playwright was Kalidasa, who wrote epic poems and plays that were much more upbeat and happy than the dreary Greek tragedies. The Indian number system developed, which was later misnamed the "Arabic numerals." The entire world uses this system of numbering today: 1, 2, 3, 4, 5, etc. A Buddhist monastery at Nalanda established a university that attracted thousands of students. A great Indian doctor named Caraka developed a code of medical ethics, and the practice of medicine flourished. Indians also developed a form of iron that could withstand rust, and it was used in buildings. Hinduism was, and is, one of the most powerful and resilient religions in the history of the world. In the 20th century it withstood communism; throughout history it withstood evangelism by other religions; and in the last millennium it withstood Islam. Hinduism focuses on "The Eternal Way," which means that certain spiritual principles are true for eternity, transcending what is man-made. This is like a science of consciousness. The advancement of knowledge is emphasized by Hinduism, and today many Indians can be found obtaining PhDs or medical degrees. Many Indians (notice that the term "Indian" in this lecture refers to South Asia) are entering engineering and similar high-tech professions, and American companies are hiring more and more Indians for these jobs because of the high quality of their work and their willingness to work for less wages by American standards. Politically, Hindus in the United States are more Republican than other immigrant groups. Hinduism encourages meditation using yoga. Historically, Hindus believed in reincarnation, a belief that spread even to the Greek philosopher Pythagoras in 560 B.C. Visitors to India are impressed or surprised by seeing cows wandering about, disrupting traffic and commerce. The expression "sacred cow" comes from the Indian belief in reincarnation, and the view that a cow may be the reincarnation of someone’s deceased relative. The basic belief of Hinduism is in a cycle of life often represented by a dancing woman in a ring of fire, who is the god "Shiva" representing creation and destruction. Other symbols are the god Brahma representing creation, and the god Vishnu representing preservation or continuance of life. In Hindu statutes a flat palm facing the onlooker represents peace, while a drum symbolizes creation. 1. Belief in the authority of the Vedas (ancient hymns to the gods, written in Sanskrit). The oldest collection of hymns in the Vedas is the Rig Veda, which was written between 1800 and 1300 B.C. The greatest Veda hymn is the "Bhagavad Gita," a section in the Mahabharata concerning life's never-ending spiritual journey towards perfection, to be attained by adhering to a code of conduct. The Bhagavad Gita is a spiritual guide to life's problems, like the parables of Christianity. 2. Spirit of tolerance and willingness to understand and respect an opponent's view. Hinduism adapts to and incorporates other belief systems. 4. Belief in reincarnation (rebirth) and pre-existence. Your teacher for this course knows a Hindu who says his misfortune must be due to his having sinned in a prior life. 5. Belief that there are many ways to salvation. Many Hindus greatly respect Jesus, for example. 6. Belief that the number of gods to be worshiped may be large, although some Hindus reject the worship of gods altogether. 7. Unlike most other religions, Hinduism is not defined by a specific set of philosophical concepts. Lacking from this modern legal definition is the caste system set forth in the Code of Manu, whereby the accumulation of a person's good deeds (or evil acts) in his prior lives (his "karma") determine whether he is born into a family at a higher or lower caste level, or even lower as an animal or plant. Upon full compliance with the Hindu moral code, the person is released from the "wheel of life" and attains unity with Brahma (universal all). This belief is known as "Moksha". Obviously the caste system is politically incorrect today, with many Hindus believing in it privately but reluctant to speak about it publicly. The highest caste is the "Brahmans" (priests and scholars). This term has been incorporated in a non-religious sense into English (spelled as "brahmins") to mean wealthy, aloof New England families, like the 2004 Democratic Presidential candidate John Kerry's family. The traditional goal of Hindus is to reach Brahma, or spiritual perfection, by observing dharma (DER-muh) (moral or religious duties of your caste). Below the Brahmans in the Hindu case system are the Kshatriya (rulers), the Vaishya (peasants), and then the Shudra (serfs). Below the lowest caste level are the "untouchables" or Harijans, who are slaves and outcasts. Few talk publicly about the caste system any more because it is so politically incorrect. In Hindu society, government was by a local prince or "raja", also spelled as "rajah". The English word "raj" means reign. The omission of the traditional caste system from the Indian Supreme Court's modern definition illustrates how Hinduism adapts to changing times. ‘’’This remarkable ability to adapt has helped Hinduism survive for thousands of years and become one of the oldest surviving religions’’’. For example, Hinduism survived the threat posed by the rival religion Buddhism simply by treating the founder of Buddhism like another god and adding him to the religion. Hinduism has treated Christianity in a similar manner, by accepting Jesus as "a" God. Today India is 82% Hindu. Hinduism holds a special reverence for all living creatures, and violence against life is prohibited. Abortion was traditionally rare in India, but some report that it has increased greatly in recent decades as the country is industrialized and influenced by Western atheistic beliefs. The attitude towards women in Hinduism is of special respect in the family structure. Women obeyed their husbands under Hinduism. A much-criticized (but rare) practice in India was for a wife, after her husband's death, to throw herself on her husband's funeral pyre to die as a way of honoring him. This is known as "sati" or "suttee" (suh-TEE). Hinduism practices cremation of the deceased. If you see a physician in American who is of Indian descent you may find the "Oath of the Hindu Physician" hanging on his wall: "... Speak the truth; Not eat met; Care for the good of all living beings; ... Be simply clothed and drink no intoxicant; ... Consider time and place; Always seek to grow in knowledge; ... Never take a present from a woman without her husband's consent; ... What happens in the house [of the patient] must not be mentioned outside ...."
Hinduism has been the backbone of Indian culture for thousands of years. This religion enabled Indians to survive countless invasions, such as by Alexander the Great in 327 B.C. when he conquered most of the Indus valley. Not even Alexander and the Hellenistic influence could change Indian culture much. Hinduism has also withstood both Islam and communism. The Hindu faith is extremely resilient to foreign beliefs, and the survival of Hinduism protected the Indian culture and way of life. Jainism is a branch of Hinduism that emphasizes the principle of non-violence towards all life. Jainism requires strict vegetarianism, to avoid killing any living species. Jainism was founded by Mahavira (540-468 B.C. ), who taught self-denial and non-violence against any form of life. Jainism's strict requirements of self-denial caused it to lose popularity, but the religion remained strong and today has over 4 million adherents worldwide (including 7000 in the U.S.). It later influenced Gandhi in India, and Ralph Waldo Emerson in the United States. Your teacher for this course was once approached for advice by a physician who is an adherent to Jainism, and before agreeing to help him your teacher first wanted to make sure the physician did not perform any abortions. It should have been obvious that physician did not perform any abortions: Jainism strictly prohibits the taking of any life. Unlike Hinduism, Jainism rejects the authority of the Vedas, the sacred scriptures of Hinduism. Siddhartha Gautama was a royal Hindu prince who lived from 563 to 483 B.C. As a young prince he was disturbed by seeing suffering in old or sick people. On one occasion, he saw a dead body (a corpse) and was deeply upset by it. As a Hindu, Prince Siddhartha believed in reincarnation but the possibility of repeated suffering in many lives disturbed him further. According to legend, he meditated for a long time under a tree and emerged from it as the "Enlightened One" who founded Buddhism. Once he became the Buddha, his followers referred to him as "Buddha Shakyamuni" ("Shakya" was the name of his royal family, and "muni" means "able one" -> "Shakyamuni"), or simply "the Buddha" for short. The term "Buddha" today can also apply to any "Awakened One" in Buddhism. Buddhism has no "God", and is often described as a "belief system" rather than as a "religion". Siddhartha declared that happiness is found not by improving one's "karma" under Hinduism, but by embracing Four Noble Truths: (1) suffering is universal, (2) craving or desire causes it, (3) the cure is to eliminate the craving or desire, and (4) following the Eightfold Path helps eliminate this desire in order to attain "nirvana". Nirvana is a release from suffering to attain inner peace and complete contentment. The Eightfold Path is a multifaceted guide to nirvana that relies on wisdom (right view and intention); ethics (right speech, action & livelihood); and mind (right effort, mindfulness & concentration). In other words, the Eightfold Path is a system of meditation that can be followed by anyone at any social or caste level, which makes Buddhism more attractive to the lower class than Hinduism, which calls them untouchables. Legend states that 49 days after the Buddha's enlightenment, he began teaching. He taught the first Wheel of "Dharma" (one's duty or nature) to achieve protection from suffering. Later, the Buddha taught the second and third Wheels of Dharma. Together these teachings became the source of the Mahayana, or Great Vehicle, of Buddhism. The Mahayana teaching describes how to attain full enlightenment ("Buddhahood") for the sake of others. The Buddha also taught the Hinayana, or Lesser Vehicle, of Buddhism. The Hinayana teaching describes how to attain freedom from suffering for oneself alone. The Buddha encouraged everyone to practice Dharma to improve inner peace and happiness, and improve the quality of life. Inner peace is considered under Buddhism to be the key to outward peace. What is the practice of Buddhism like? Buddhists seek a moral life that emphasizes meditation. The goal of the meditation is to end cravings and desires and attain a release from suffering, or "nirvana". Buddhism also encourages increased wisdom and understanding. Buddhists tend not to proselytize aggressively, but does fully accept converts. There are Buddhists in most countries today. Founded in India, Buddhism has grown to become the fourth largest world religion (behind Christianity, Islam and Hinduism, in that order). A strict version of Buddhism spread in Southeast Asia (e.g., Cambodia and Vietnam). A more liberal (less strict) version spread into China, Japan and Korea. Buddhism has a larger following in the U.S. today than Hinduism, but Hinduism is much stronger than Buddhism in India. The most famous Buddhist is probably the Dalia Lama, who won a Nobel Peace Prize and lives in exile in India after advocating independence for Tibet from communist China. There are many statues of the Buddha, and they vary from country to county to show the Buddha as an inhabitant of the local country. The hand position (mudras) in the statute shows whether the Buddha is teaching, giving a blessing, or meditating. Buddhism welcomes all and has an easier time gain converts than Hinduism does. But Hinduism, with its stronger emphasis on families and a social structure, has far more adherents than Buddhism does. 1. Both religions promote meditation and other forms of spiritual practice. 2. Both religions preach non-violence towards all forms of life. 3. Both religions believe in karma. 4. Both religions believe in multiple hells and heavens. 5. Both religions emphasize detachment and renunciation of materialism, and treat desire as the major cause of suffering. 1. Buddhism does not believe in the existence of souls or "first cause" (God). For this reason many do not consider Buddhism to be a true religion, but merely a belief system. In contrast, Hinduism believes that Brahman is the Supreme Creator and that the soul (Atman) does exist. 2. Buddhism views the world as filled with sorrow, and the highest goal of human life is to end sorrow. In contrast, Hinduism has four major goals for everyone to pursue: religious duty (dharma), wealth (artha), desires (kama) and salvation (moksha). 3. Hinduism believes in four stages in life (ashramas), while Buddhism rejects this. 4. Hinduism is a religion of the individual and thus has no monks. Buddhism has many monks. 5. Hinduism does not have any prophets, while Buddhism reveres Buddha as its founder. 6. Buddhism rejects the sacred scriptures of Hinduism, the Vedas. The Hindu response to the competition presented by Buddhism was to treat Buddha as another god of Hinduism (the incarnation of Mahavishnu, one of the gods of the Hindu trinity). This was typical of how Hinduism adapted to other religions to thwart the competitive threats. This enabled Hinduism to remain far more popular than Buddhism within India, but not outside India. What can we thank ancient India for? Our Arabic numerals, which are derived from Hindu numbers. Also, near the end of classical India (around A.D. 500) the game of chess was invented there. Notice that the game of chess does not involve any chance; Hinduism is against gambling. The original game of chess lacked the powerful "queen", and Muslim versions of the game lack the queen to this day. Vedic mathematics, which is an ancient math system found in the Hindu scriptures, is taught to this day. It emphasizes solving complex math problems orally. India first discovered the separate concept of "zero" around the sixth century, which was a significant intellectual breakthrough. Indian religions add a transcendental quality that has found popularity worldwide in the form of meditation, and some American liberals left Christianity for it. Ralph Waldo Emerson, a 19th century Massachusetts writer, was an example: "I owed a magnificent day to the Bhagavat-Gita. It was the first of books; it was as if an empire spake to us, nothing small or unworthy, but large, serene, consistent, the voice of an old intelligence which in another age and climate had pondered and thus disposed of the same questions that exercise us." Today, the popularity of the English language in India, its low cost of living, and its intelligent workforce make it an attractive place for large American companies to relocate or "offshore" their jobs. Often when Americans call "customer service" for large companies, they are actually reaching low-cost operators in India, sometimes using Americanized first names. India is more than a country. It is a subcontinent. It is vast in size: two-fifths the area of all of Europe. 150 different languages are spoken there today. Even though India has traditionally been a poor country, for decades it has produced more food than it can consume. China, like India, is significant because it has so many people. China and India each has a population of about 1 billion persons today, and one third of the entire world now lives in China or India. Japan, North and South Korea, Vietnam, Indonesia, Pakistan, and many other countries are also part of Asia, and Asians make up more than half the world's total population. But China and India are vary different from each other. There is no Hinduism in China. There is very little ethnic diversity in China, in contrast with India and many Western countries today. Christianity has struggled to convert China, and only about one out of nine Chinese are Christian. And even that small number is due to courageous efforts in the face of much persecution of religion by the communist government that rules China. China has always been isolated by geographic protections. The highest mountains in the world, the Himalayas, separate it from India. The Himalaya Mountain Range is famous for having the world's tallest peaks, including Mount Everest and K2. Vast amounts of semi-desert land known as the Gobi desert separate China from the Middle East and the area which was Mesopotamia in ancient times. In the south of China, the Yangtze river flows for 3000 miles, navigable from the sea for half of its course. In the north is the Yellow river (now called the Huang He), which runs westward from the Yellow Sea (labeled in the map) and then northward a bit before turning south. The Yellow river obtained its original name from the murky tan color of its waters. The Yellow River is known for its tendency to flood surrounding lands, often with disastrous results. The silt and sand carried in the muddy water builds up on the bottom of the river until it blocks the water's flow and causes the river to divert its course, flooding into another area. Floods like these make the course of the Yellow River change often. The earliest archaeological evidence in China is of the Shang dynasty, 1766-1122 B.C. By folklore it began when a virtuous and wise man named T'ang overthrew the decadent emperor Chieh of the Hsia dynasty. The Shang dynasty ended when it was ultimately overthrown and replaced by the Chou dynasty. The Shang dynasty built cities in northern China, along the eastern banks of the Yellow river. It did not control all of the land that belongs to China today. Sometimes called the Yellow River Civilization, the Shang dynasty benefited from the use of bronze, which Mesopotamia had introduced to China around 2000 B.C. Notice that Bronze had previously been invented in Mesopotamia around 3000 B.C. The Shang dynasty had writing in the form of oracle bones: questions and answers inscribed on actual bone. For archaeologists, these bones were the first concrete evidence that the Shang dynasty really had existed. Oracle bones were widely sold as "dragon bones" and believed to have magical healing properties, and the bones were generally ground up and used as medicine. No one realized what the bones were until a high ranking official who was sick noticed that the bone which was to be ground for his medicine was covered in strange glyphs! His discovery proved the existence of the Shang dynasty. The Shang empire consisted of city-states, with much war between the various cities but particularly against the non-urbanized, agricultural populations in the rural areas. The capital cities shifted as often as power changed hands. The Shang dynasty perfected the wheel and used chariots in warfare. China used a pictographic form of writing that it continues to utilize to this day, albeit in a more developed form. Then the word looked like its meaning, but today the characters are much more complex. The Zhou (also known as "Chou") dynasty replaced the Shang dynasty in 1027 B.C., and benefited from the Iron Age. The Iron Age is the period of human history characterized by the smelting of iron and its use in industry in western Asia and Egypt. The Zhou dynasty lasted longer than any other dynasty in Chinese history, ruling until 221 B.C. The multiplication table, which is essential to learning arithmetic, was developed during this dynasty. Early Chinese religion consisted of worshiping a supreme god called "Shang Ti," or "Lord on High." Shang Ti was believed to be a god ruling over the lesser gods of the sun, moon, wind, rain and other aspects of nature. The ancient Chinese people worshiped these gods with human sacrifices. When a king died, for example, hundreds of slaves and prisoners would be sacrificed in his honor. There were also sacrifices on a smaller scale when a temple or palace was constructed. The first military treatise was written by Sun Tzu in the 6th century B.C., known in English as the "Art of Warfare." It became a classic of military strategy used by generals and even modern businessmen, and is available freely on the internet. "To see victory only when it is within the ken of the common herd is not the acme of excellence." The "Art of Warfare" reflects insights shared by the ancient Chinese culture. The last item above about seeing victory, for example, reflects an observation of another ancient Chinese sage named Ts'ao Kung, who remarked that the goal is to recognize a fruitful plant before it germinates. In order words, success depends on being able to anticipate and work to succeed in the future. The great figure in ancient China was Confucius, who lived from 551 to 478 B.C. and taught social ethics to the people. This was around the same time as the early Greek philosophers. The name "Confucius" is simply a Latin translation of his real name, Kung Fu-tze, by Western historians. Confucius's disciples wrote down his teachings in a book called the Analects, which focused on man's duties to obey a universal natural law. Moderation in conduct, or "li", was emphasized, and filial piety (respecting the older members of one's family) was the goal of the practices outlined in the Analects. Age itself is greatly honored in Chinese culture, unlike Christianity: the older a person was, the wiser he must be. Confucius taught rulers to be just, and said those being ruled should be loyal to their rulers. Confucius wrote little himself, but his disciples recorded his teachings in the Analects. This book became a "classic" (widely read and respected text) and has had enormous influence over Chinese history. Confucius emphasized rational analysis with a touch of flexibility. He disavowed any original insight or knowledge, and opposed anything egotistical. He once said, "I for my part am not one of those who have innate knowledge. I am simply one who loves the past and who is diligent in investigating it." After Confucius died there was an era of the Warring States, from 481-221 B.C. During that time several teachers emerged with their own interpretations of Confucian thought. The two leading ones were Mencius (371-289 B.C.) and Hsun-tzu (298-230 B.C.). Mencius felt that mankind was essentially good and that philosophers like himself should run the country. Hsun Tzu, in contrast, felt that man was intrinsically evil and that a wise and powerful ruler was necessary to maintain order. Hsun Tzu's ideas became powerful, and laid the intellectual groundwork for the brutal Chinese dictatorships that followed the Warring States: the Chi'in or Qin state (221-206 B.C.). Ch'in was the first unified Chinese empire, and its king was Shih huang-ti. It lasted until the Han dynasty rose to power in 206 B.C. The Han dynasty then lasted 400 years until A.D. 220, and its name is still used to describe the ethnicity of 93% of Chinese today. We will discuss these important dynasties below. But first, let's examine the prevalent religious beliefs of ancient China. Taoism (pronounced as "Daoism") eventually caught on in China and Southeast Asia (e.g., Vietnam) more than other religions, probably due to its compatibility with the philosophical foundations laid by Confucius. Taoism is significantly more philosophical than the world's largest religions of Christianity, Islam and Hinduism. The symbol for Taoism (see right) is the Taijitu or "Yin and Yang," in which a curved half of a circle divides a shaded from a clear region to represent a constant interaction in nature between two forces having opposite qualities. The Yin (darker side) is passive or negative or feminine; the Yang (lighter side) is active or positive or masculine. While western philosophy often views this dualism as a struggle, in China the goal is to harmonize these complementary forces. Taoism and Confucianism strive to obtain harmony, though in Taoism the focus is on nature while in Confucianism the focus is on people. The basic differences between Confucianism, Taoism and a third philosophy in China called "Legalism" were the following. Confucianism emphasized education, tradition, reference for elders and ancestors, and a strong government. Taoism emphasized harmony with nature, and preferred the least amount of government. Legalism, the forerunner to modern communist China, held that a strong government was essential to control the people. Buddhism, which was popular in India, emphasizes personal salvation more than the Taoism of China. It makes little difference today in China, where the communist dictators impose atheism as the official belief system. But in ancient China, before communism, these religions competed with each other for followers. Taoism advanced at the expense of Confucianism, which lost followers until northern rulers reestablished the Mandate of Heaven. The Mandate of Heaven was a theory that heaven blessed good rulers but overthrew bad ones, and was first used by the Zhou Dynasty to justify overthrowing the Shang Dynasty. These northern rulers obtained control in A.D. 589 under the Sui and Tang Dynasties. The first imperial or national Chinese dynasty was the Qin or Ch'in dynasty (221-206 B.C. ), which was founded by the ruler of the Zhou vassal state Qin, Prince Zheng (also known as Shih Huang-ti). The Qin dynasty was superb in battle, using chariots and iron weaponry, and that enabled Prince Zheng to conquer all the Chinese states and unify the country. The Qin dynasty built many internal improvements, such as roads, canals and irrigation, using iron and bronze tools. It was the Qin dynasty that began to construct the Great Wall, which stretches today for 1,400 miles. China has always feared and been threatened by foreign invaders, and the wall was a way to defend itself by augmenting the natural protections of geography. It is from "Qin" that the name "China" is derived. But the Qin dynasty's highly legalistic approach to governing eventually led to rebellion. The Han empire or dynasty (206 B.C. to A.D 220, with only a brief interruption from A.D. 6-23) built on the foundation of the Qin dynasty - literally. The walls and roads were extended and improved during this period. Liu Bang was the first Han ruler, and he imposed a centralized government that was stable for many years. Empress Lu was a woman who seized power from 195 until 180 B.C. and then installed her sons as emperors while they were still infants. Han Wudi (141-87 B.C.) was the longest serving Han ruler. He was known for appointing efficient provincial administrators. The Han dynasty expanded the territory of China into Vietnam and Korea, and administered justice to the country from a centralized and organized civil service. This was the most significant of all Chinese dynasties, and is compared by historians to the Pax Romana period in the Roman empire (which we will discuss in the next lecture). The Han dynasty valued education highly, and even created a scholar class of people known as "shi". Historians criticize the Han dynasty, however, for treating women in an inferior manner. The Han dynasty developed the famous Silk Road: 5,000 miles of interconnected roads linking China to the Mediterranean region, which enabled trade in silk and fine goods to greatly increase. Buddhism spread widely along the Silk Road, promoted both by traders and Buddhist monks, and reached China in A.D. 100. Another new religion designed to appeal to merchants, Manichaeism (named after its founder Mani (A.D. 216-272)), also spread to Turkish nomads by teaching self-denial and acceptance of both Buddha and Jesus as prophets. Notice how Buddhism would predictably become more popular outside India than Hinduism did; Buddhism was not based on one's class or family heritage, while Hinduism was. Trade flourished on the Silk Road, which China used to transport silk, spices gems, wine, cosmetics and even grain to the Mediterranean. By land the traders carrying the goods to all groups in the Middle East; by sea the Malay sailors mastered the tricky monsoon wind patterns. The Silk Road was influential from 150 B.C. to A.D. 900. Perhaps one might compare its enormous influence to the internet today! Today, an important railway runs along a common route which had been part of the Silk Road. The state philosophy of the Han dynasty was Confucianism. Technology advanced during this time, as did the arts. Paper, porcelain, the magnetic compass, the fixed rudder, the seismograph and possibly acupuncture were all invented under the Han dynasty. Detailed historical records were maintained. Most Chinese people were farmers, but China's discovery of iron enabled it to develop some highly profitable manufacturing trade. The Han dynasty declined, in a manner similar to the decline and fall of the Roman empire, though a bit earlier. Historians cite the same reasons for the decline of both empires: too vast an empire to administer and keep together, invasions by barbarians, hardship caused by the spread of disease and poor harvests, and overall economic failure. In both cases, leaders of the armies gained power as the empires declined, but the generals could not save the empires. Historians credit both the Han dynasty and the Roman empire for their lasting contributions to the world: roads and, for a while, peace and prosperity. The Han dynasty left us with paper, a greater emphasis on education, and the marvelous Silk Road. The Roman empire left us with a system of laws, a powerful language (Latin), and the spread of Christianity. But just as the West fell into disorganization once Rome fell, so did China when the Han dynasty collapsed. China was ruled by regional governments known as the Three Kingdoms (A.D. 220-280). Many legends arose during this period, as described in a Chinese literature classic entitled, "The Romance of the Three Kingdoms." It was not until A.D. 589 that the Sui Dynasty arose to reestablish centralized government. Subsequently the longer Tang and Song Dynasties ruled China also. What inventions do we owe to ancient China? A great deal: paper, the compass, the umbrella, the fan, spaghetti, acupuncture, bamboo cultivation, harvesting silk, and perhaps the first planetarium. Chinese invented fireworks and then, in A.D. 850, Chinese invented gunpowder too. English philosopher Francis Bacon said this about three Chinese inventions: "Printing, gunpowder and the compass: These three have changed the whole face and state of things throughout the world; the first in literature, the second in warfare, the third in navigation; whence have followed innumerable changes, in so much that no empire, no sect, no star seems to have exerted greater power and influence in human affairs than these mechanical discoveries." Sometimes historians refer to the "Four Great Inventions": paper-making, printing, compass and gunpowder, and claim that China deserves credit for all four. Debate: Which was the greatest of the Chinese inventions? The most significant person in history was Jesus of Nazareth, also recognized as Jesus Christ. Do you know the etymology (word origin) of the name "Jesus"? She will give birth to a son, and you are to give him the name Jesus,* because he will save his people from their sins. The footnote for "Jesus" (*) in the above NIV translation explains, "Jesus is the Greek form of Joshua, which means the Lord saves." The ancient Greek, Hebrew and Latin all lacked the modern English letter "J". The Hebrew initially spelled Jesus as "Yeshua" and "y'hoshua", using two different spellings because of the tradition against pronouncing "the sacred part of Yahweh's name, so they changed the 'Yah', to 'Yeh'." The ancient world had several founders of great religions, but only one performed miracles: Jesus of Nazareth. His resurrection is the single greatest event in the history of the world. We can estimate the date of the Resurrection because we know it happened during the reign of Pontius Pilate: between A.D. 26 and 36. A Roman historian named Philo described Pilate as inflexible, obstinate and merciless, and Pilate was hated by the Jewish people under his rule. The Gospels describe the savage retaliation by Pilate against Galileans as follows: "Now on the same occasion there were some present who reported to Him about the Galileans whose blood Pilate had mixed with their sacrifices." Years after the Crucifixion of Jesus, the Romans (who were themselves known for cruelty) removed Pilate from power for being too cruel even by the harsh Roman standards! A detailed analysis of the Gospel and historical sources places the date of the Crucifixion at Friday, April 3, A.D. 33, although some historians think it occurred in A.D. 29. From these dates come the traditional view that Jesus was 33 years old when He rose from the dead. However, the Gospels do not specify His age and it is not entirely clear precisely when Jesus was born. We do know from the Gospels that He was less than 50. Many historians place his birth between 6 and 4 B.C. The description of Jesus' birth in the Gospel of Luke refers to King Herod, whose brutal reign was from 37 to 4 B.C. An error occurred in the dating of our calendar from Christ's birth in the sixth century A.D., when the Roman monk Dionysis the Little changed the calendar to recognize the birth of Christ. He calculated that Jesus was born the year that King Herod died, and modern historians agree. However, the monk thought that Herod died 753 years after the founding of Rome, instead of the correct 749 years after the founding of Rome. (King Herod is the ruler who ordered all babies in Bethlehem younger than 2 to be killed in his unsuccessful attempt to murder Jesus, whose family fled to Egypt to escape this.) Thus the monk estimated that Jesus was born four years later than He probably was. What was intended to be A.D. 1 was actually 4 B.C. Notice that there is no year "0", as the concept of "0" was unknown to the Greeks and not even discovered until the seventh century by mathematicians in India. The year that followed 1 B.C. is A.D. 1. The teachings of Jesus were recorded in the Gospels (the word is from Middle English "god" and "spel" for "news", or "Good News") by three of His Apostles (Matthew, John and also Mark, a scribe for Peter) and by a physician (Luke). The oldest known versions of the Gospels are in Greek, the common lingua franca (common or commercial language among diverse peoples) of the Roman Orient. No original Gospels have been found in Aramaic; the only discovered Aramaic Gospels are translations from Greek versions. Some say that the Gospel according to Matthew was written particularly for Jews, that the Gospel according to Mark was written particularly for Romans, that the Gospel according to Luke was written particularly for Greeks, and that the Gospel according to John was written for everyone. Matthew and John were part of Jesus's original Apostles, and Mark was probably a boy being homeschooled by his mother as she followed Jesus. With Mark's better education from being homeschooled, he was later able to serve as the scribe for Peter. Scribes were sent forth by Jesus to proselytize the world. "I am sending you prophets and wise men and scribes ...."
Luke was a Greek physician (see Col 4:14) who accompanied Paul and also wrote the Acts of the Apostles describing the arrival of the Holy Spirit. Unlike the firsthand Gospels of Matthew and John, the Gospel of Luke records eyewitness accounts of others, much as a doctor asks a patient for his medical history and then writes it down in the medical file. Due to Luke's professionalism, his Gospel is comprehensive about Jesus's life and resurrection, and conveys the great sense of joy that Christians felt. In the Battle of the Bulge in World War II (the surprise Nazi counterattack in Dec. 1944), which was one of the worst military defeats in American history, a minister's son who had memorized Luke's description of the Nativity recited it for his fellow soldiers on Christmas Eve while together in the trenches. Many of the American soldiers died in battle soon afterward. The greatest writing in the history of the world is the Gospel of John, the teenager whom Jesus loved like a son. John revised and perfected this Gospel for many decades before releasing it to others. As was typical for many of the greatest authors, such as Copernicus, John's work was probably not released to the public until he passed away. Isaac Newton also delayed publication of his great mathematical discoveries for decades. As long as something can be improved further, there is no reason to publish it prematurely and confuse the public with multiple versions. American soldiers in World Wars I and II would carry copies of the Gospel of John with them as they journeyed to faraway battles. This single book has done more to shape human thought and behavior than any other work. America's First Amendment right of free speech is based on ministers preaching of the "Word" of God as described at the beginning of the Gospel of John. Archaeological discoveries in Jerusalem confirm, to the dismay of skeptics, the truth of many references in the Gospels about Jesus's work. The Pool of Bethesda has been discovered (John 5:1f). The Pavement has been found (John 19:13). The setting of Jacob's well has been discovered (John 4). Because Jerusalem was destroyed by the Romans in A.D. 70, it would have been impossible for a writer after A.D. 70 afterward unfamiliar with these locations to be able to refer to these specific locations. Paul of Tarsus (now southern Turkey) was Jewish and converted to Christianity within a year or two of the Crucifixion, while on the road to Damascus (now located in Syria), and afterward spread the Good News far and wide within the Roman empire. He was both a prolific writer and scholar, and a prodigious missionary who traveled on three great missions throughout the Roman empire before being executed by a beheading in Rome in A.D. 62 (as a Roman citizen, Paul could not be scourged or crucified). Many of Paul's letters are included in the New Testament, and often quoted to this day. For example, in Paul's letter to the Romans, he condemns homosexuality. Peter, who was not a Roman citizen, likewise spread the faith before being crucified in Rome, by his choice upside down out of the utmost respect for Jesus's own Crucifixion. One misconception about early Christians is the claim that they could not read or write. But several early Christians wrote letters while held in jail by Roman authorities. Moreover, many of the insights and truths revealed in the Gospels by the Apostles could only have been understood and taught by people of tremendous intelligence and faith. Mark founded a church in Egypt under the reign of the Roman emperor Nero, first converting Alexandrian Jews such as Theophilus and also converting many native Egyptians who were neither Greek nor Jewish. It was for Theophilus and the Egyptian community that Luke wrote his Gospel and Acts of the Apostles, addressing Theophilus in the beginning of each. The local language in Egypt was Coptic, and translations of the Gospels into that language have been discovered which date from the first half of the second century. Coptic Christianity remains in Egypt now, although Islam has become the dominant religion there. Some cite the acceptance of Arabic as a liturgical language by the Pope of Alexandria as aiding the rise to dominance of Islam there. Coptic Christians celebrate Christmas each year on January 7th. The Apostle Thomas, known as the "Doubting Thomas" traveled as far as India and established a small Christian community, which continues to thrive there. Christianity is unique in its peaceful evangelism, spreading its truths through freedom of speech. ↑ See Luke 1:3 and Acts 1:1. This page was last modified on 23 January 2014, at 11:48.